Chinese buffet style donuts seem to be a menu item found on most Chinese buffets. It is easy to recreate these donuts at home. Chinese Buffets are known for a standard set of dishes. You are always going to see fried rice, Sweet and Sour Chicken, and even a great seafood bake. For some reason, often by the fried wontons, you are going to find these donuts. These donuts are delicious and very easy to make. To make these donuts you are going to need some canned biscuits. I don’t recommend purchasing ones that are expensive, in fact, by the least expensive that you can’t. Definitely, do not purchase the flaky ones if you want to recreate this recipe at home. You will also need oil to fry these in. I typically use plain vegetable oil, other types of oil would work, you could use corn oil, soybean oil, or even peanut oil. You will simply open the can, cook the donuts until they are golden brown on both sides, drain the donuts on either a wire rack or some paper towels after you have dredged them in sugar. I recommend cooking the donuts at 350 degrees. You will want to use a thermometer to check this temperature. While Chinese Buffet Style Donuts may not be the world’s healthiest treat, they are quite delicious. You may want to try these not with a meal, but you may want to try them for a weekend breakfast. Do you love donuts? Be sure to check out these copycat donut recipes. 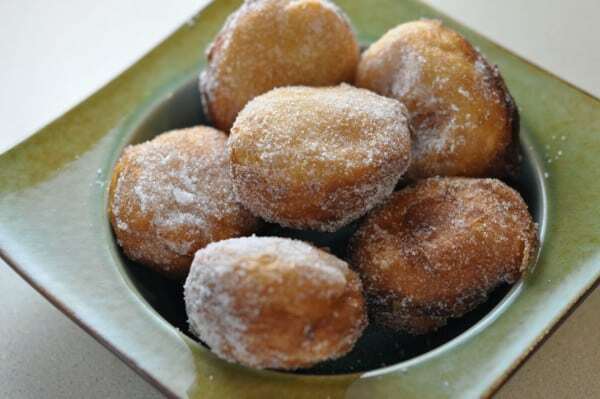 Enjoy Chinese Buffet Style Donuts, even more, when you make them at home. Use either a deep fryer or a large deep skillet. Be sure to add enough of oil to line the bottom of the pan a couple of inches deep. Make sure the oil heats up to 350 degrees before frying. Pour sugar into a small bowl. You will dredge the donuts in the sugar after they have been removed from the oil.Allow the donut to brown on one side, turn over. This should take about 90 seconds. Be sure to fry only a couple at a time, or the oil may cool too much, and the donuts will absorb too much oil.When golden brown on both sides remove from oil and drain on paper towels or a wire rack. When the donuts have cooled for about 15 seconds dredge in the sugar. 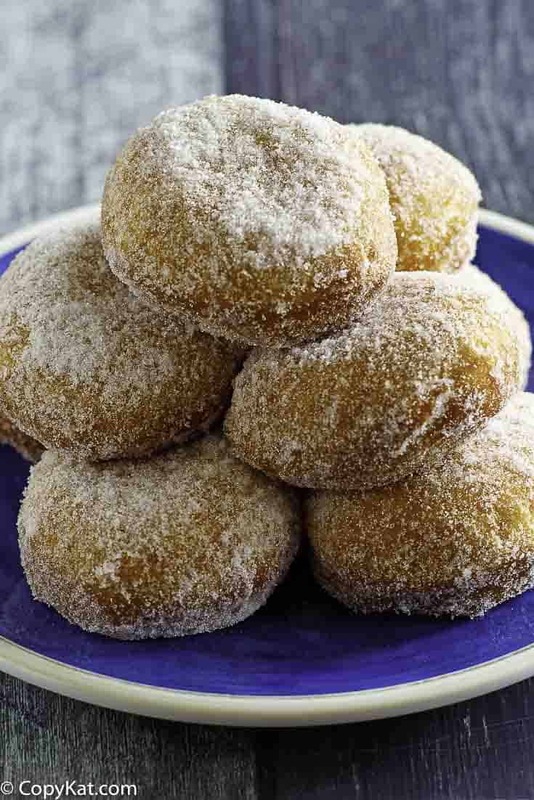 Interesting recipe but I am presently in Hong Kong for work, been here already 2-years, and have to say I’ve never encountered anything like these doughnuts! 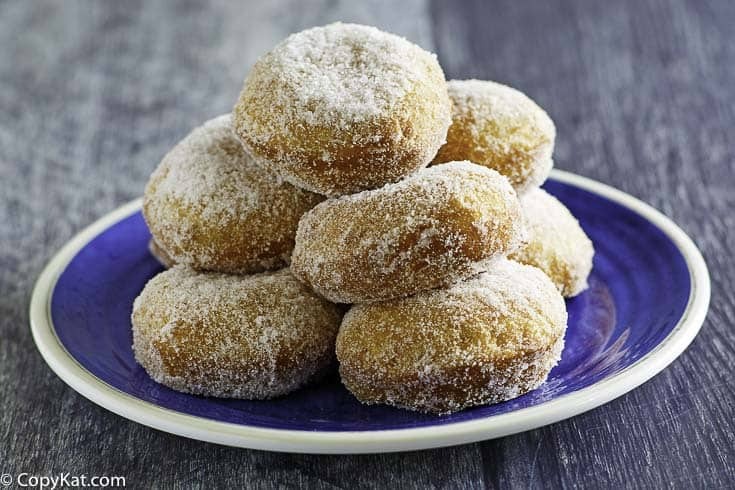 There is a dessert pastry which is deep fried and rolled in sugar but it is more like a choux paste/pastry in texture although somewhat more dense. Thanks for the great recipes though! My guess these “Chinese donuts” are a “Chinese American” dish just like General Tso’s chicken. There are many dishes that were created in the US for the American audience. Can u use cinnamon rolls instead of plain ones ? You could poke a hole in the center of the dough with your finger. For this recipe, I just took the biscuits out of the can, and deep fried them. How about try to copycat white castle burgers if anyone can do this it would be you i’ve tried came close but still missing something. Thank you for your suggestion. I will have to keep this in mind during my travels. Right now I can only get the frozen ones. Right?! Nobody’s building a rock ship here, ya know?! Lol! People come to my blog with all sorts of cooking skill levels. While you may not need the instructions, I sometimes I some very basic questions! Can you use homemade biscuits? Which biscuit dough do you use, (Without naming a brand name), the small ones or the big ones. I use a can of inexpensive biscuits, store brand if available. Hi, do I cut the biscuits or fry them whole. I am new to cooking. Fry whole but I’m sure cutting them in half would be fine. What type of oil is best to use? In Chinese lo mein as well? Ideally I would use peanut, but you can use what you have on hand. Made these tonight but I used my frozen yeast pre-made rolls. Thawed and allowed them to proof. Flattened out to about 1 ” thickness, deep fried in 375 degree canola oil.Once golden brown on both sides, rolled them in white granulated sugar. So good!!! Then I think you will have jelly donuts! Yes you can they cook quickly. Have your eve’s on them at all times. Make sure there thoroughly cooked before you rook them in sugar. Pan frying doesn’t make a difference at all then deep frying! Have fun! What should the temp of the oil be? It should be at 350. Stephanie Manley, I have the same question as Dee. We made them yesterday, the outside was perfect, the inside was doughy. Any suggestions? You should cook them a little bit longer, or you may want to flatten them a bit before you fry them. Get a frying thermometer or get an electric fryer with temp settings. No home stove on earth has temperature settings for the burners. You are right no home stove has temperature settings. I have found you can fry on the stove, you may need to use a candy thermometer to assist. Invest in a thermometer, especially one for oil. You can find them at a kitchen supply store or maybe your local grocery store. You could also find them on Amazon. This will give you the temperature of the oil, not the amount of heat being put out by the burner (the numbers you mentioned). If you want them to be that exact shape you can. Yes! I tried making them but the inside is not fully cooked yet When the outer is like almost burnt already. Am I doing something wrong? Try to make them smaller. A lot of the time they are just to big. Your dough maybe to cold also. This always happens to me when the oil is too hot. Just turn down the burner and you will have much better results. Loved these! I also roll them in cinnamon and sugar as well! What temp. do you fry them at?